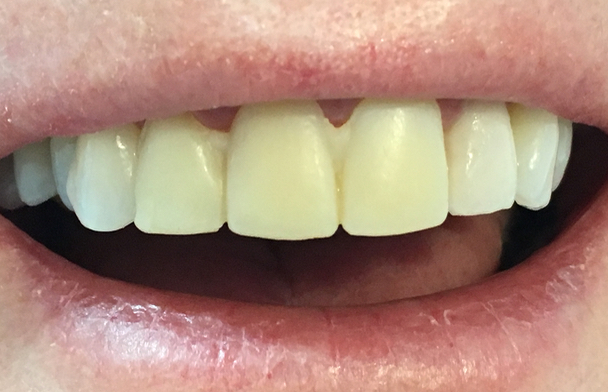 Temporary Veneers - Will They Look Good? Temporary veneers (or interim veneers) are fitted over teeth that have been trimmed down a bit in readiness for permanent veneers, while the permanent porcelain ones are being made in the dental laboratory. The temporary (or "interim") veneers are made of tooth-colored acrylic resin, and stay on your teeth for about 5 to 10 days, until the permanent ones are ready. The acrylic is tooth-colored, and can look very good, almost as good as the final veneers. BUT there is one problem with the acrylic that you really need to know about. READ ON to find out all about it! Temporary veneers are made by the dentist, right at the chairside, as opposed to being manufactured in a dental laboratory. They can be quite difficult to do well, and the dentist has to take his time! Why do you need temporary veneers? Appearance. When your teeth have been trimmed down a bit, they may look a little odd! Getting interim veneers fitted will make the teeth appear normal. Sensitivity. The teeth can be sensitive to cold air or drinks after the preparation for veneers. The temporary ones cover over the exposed sensitive areas, and protect them. A chance to test drive the new shapes. Frequently, it's possible to make the temporary ones in almost the exact same shape as the final ones. This means you can see and feel how the final veneers will be. If you want to make any changes, you have the chance now! When might you NOT need temporaries? You are getting "no prep" veneers, because your own teeth don't need any trimming. You are getting Cerec veneers, which are made on the same day as the teeth are trimmed. How are the interim veneers made? There are 2 methods. If you are only having from 1 to 3 veneers, then your dentist may choose to make up the interim veneers by hand, using a tooth-colored filling material. He can sculpt and shape the filling material directly on your tooth so that it has the size and shape that you are aiming for with the new veneers. Your dentist will probably fix the filling material to the tooth using just a small drop of bonding agent ("glue") on the tooth. This will be strong enough to hold the interim veneer in place while you are eating and drinking, but also allow him to pop it off easily enough when it's time to fit the permanent veneers. The other option, which is frequently used when you are getting 4 or more than 4 veneers, is to use a small mould of the wax mock-up. During the planning phase of your treatment, the lab guy will have made up a model of your teeth with the new veneers built in white wax. They will be exactly the size and shape of the final veneers. Your dentist can make a small putty mould of the mock-up, and use it to make the temporaries. He can put a little liquid acrylic into the mould, position it over your own teeth (after the trimming), and the acrylic then sets in the shape of the mock-up. When the dentist takes the putty mould out of your mouth, the acrylic is left behind on your teeth, a perfect copy of the wax mock-up! The edges will need to be polished, and any excess bits taken away, but within a few minutes it's all done. In the photo above, their are 3 temporary acrylic veneers on the front teeth. I have just taken the putty mold off, and now I still have to trim and polish the veneers, PARTICULARLY in between the teeth. So now you have tooth-colored acrylic veneers in the size and shape that the dentist and lab guy have planned. You can see how the final veneers will look and feel. If you think that you want to change something, for example the front teeth are a little too long, you can tell the dentist. He can then instruct the lab guy to make this change to the permanent veneers as he's building them up. The acrylic veneers stay in place because they are all joined together in one piece, and "lock in" between your own teeth. They are not bonded to the teeth, and so you may experience some sensitivity with cold water or when brushing your teeth. This is normal. This also means that you can't floss easily between the temporary veneers. However it IS possible by using either a dental floss threader, or Oral B Superfloss, to thread floss between the veneers at gum level. I recommend trying to get floss through between the veneers if you can, but go very gently! And you should continue to brush the gums around the veneers as normal. Go nice and gently over the temporary veneer surfaces with a soft brush head on an electric toothbrush, and then very slowly over the gum edges where they meet the veneers. Don't worry about loosening a veneer, it's much more important to prevent plaque building up! It's important to understand that the acrylic of your interim veneers is slightly porous. Under a microscope, it looks like a sponge. This means that it will tend to pick up staining from anything you eat or drink that is highly colored, such as dark sodas, black tea and coffee, and of course smoking cigarettes. But there is one food that seems to stain more than anything else - turmeric, a bright orange spice used in Indian and Thai foods. This will make your veneers look electric yellow, and toothbrushing won't get it off! So, DO NOT eat any spicy colorful foods while you have the acrylic veneers on your teeth. Temporary veneers can look very good, although it's important to remember that they can not look as good as the final porcelain veneers. However they serve to protect the teeth, and give you a trial run of how the final veneers could look. So look after them!